But, in a way, the depth of conservative animosity for a bike-share program makes perfect sense. 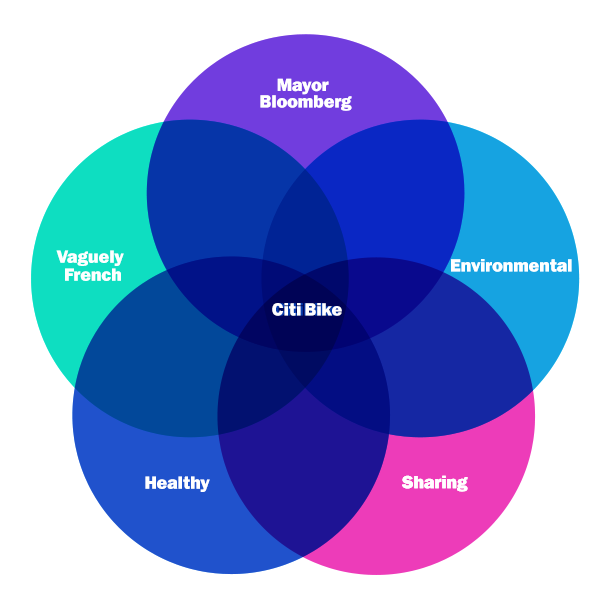 Because, as the Venn diagram above indicates, Citi Bike finds itself at the very nexus of five different things that conservatives hate. Sharing: So central to the concept of bike shares, they put it right in the name. But conservatives hate sharing — tax dollars, calamari, doesn’t matter. True story: Louie Gohmert never shared a toy for the duration of his childhood. It is a very slippery slope from sharing bikes to sharing everything. You blink and all of a sudden we’re a socialist dystopia, and everyone’s eating Bloomberg Vitamin Mush for every meal. Vaguely French: French people ride bikes, right? Like, more than other people? There’s something vaguely French about this whole thing. Doesn’t sit well.